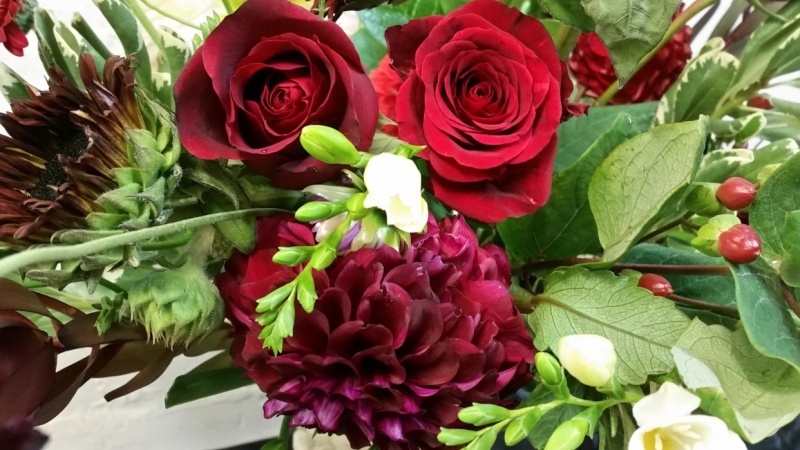 Cafe au lait dahlia, chocolate sunflower, red roses, purple scabiosa, etc. 8/15/16Gave it another shot. The photos make it look very holiday/Christmas-y but in person, not so much. Some of the dahlias and zinnias have orange-y tints, and the scabiosa is very purple. This was my second attempt at this project as the container I used for my first attempt was way too small and the chicken wire fell over everywhere. Dahlias are beginning to come into season on the East Coast so I found some white ones and combined them w/some white hydrangea, ranunculus, and roses that I already had. The blue thistle and smokey green of the eucalyptus leaves complemented each other nicely. I would have liked it to be fuller in the middle but I ran out of flowers.